“Last night, Trump made a hilarious typo. Thankfully, I was on twitter when it happened and immediately included “covfefe” in an emergency dog rate. We then put the word on a hat and added it to our store. Many of you thought it was the best thing ever, but a few comments that stuck with me referenced how it’s not the most honest way to make a few bucks. In the heat of the moment, I added that we would be donating half of all profits to Planned Parenthood, an organization with values opposite our current administration. I thought it was perfect. Immediate feedback was positive and encouraged more people to by the hat. This morning I woke up to a ridiculous amount of backlash for my decision. I let my personal beliefs infiltrate an account that’s not meant to share them. This isn’t really a good excuse after two years of running the account, but I am still learning. And today I learned that rushing decisions involving your money and a very sensitive subject is irresponsible. So, since we already said we would, and many of you bought it because we said we would, we will still be donating that money to PP. But I saw some comments suggesting we donate to dog shelters, which is obviously much more on brand for us. So, I will match whatever we end up donating to PP, and donate it to a local shelter. 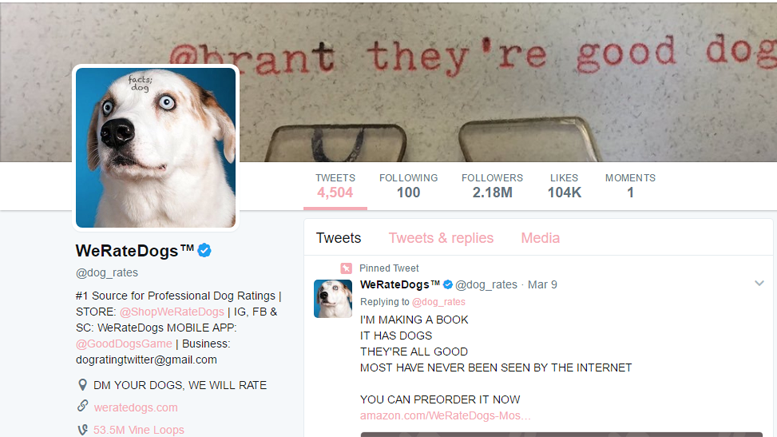 The widely-popular Twitter dog ratings account WeRateDogs™ announced last night that it will donate 50% of store merchandise profits to Planned Parenthood. The move seemed to upset some fans, who tweeted their “dispupointment” with the move. This is not the first time WeRateDogs has gotten political. The account occasionally RTs anti-Trump tweets or tweets promoting liberal social activism. WeRateDogs was launched in 2015 and quickly gained a cult following for their pictures of “doggos” and “puppos” with cute and often snarky captions, along with a rating that almost always is above 10/10. When its rating system was questioned by a Twitter user, WeRateDogs tweeted back, “They’re good dogs, Brent,” sparking a Twitter moment that went viral. In a time where everything is politicized, pictures of cute doggos are a welcome escape from politics. Dogs are something that should unite us all. Regardless of your personal views of Planned Parenthood, we should all agree that some things should remain above politics. If WeRateDogs wishes to fund a charitable cause, there are millions of shelters full of very good dogs that need donations. At the end of the day, this move is a h*ckin bad decision. 0/10 would recommend.